FitFlop footwear features a patent-pending Microwobbleboard midsole which can help increase the time that your muscles are engaged every time you take a step. In 2006 FitFlop™ founder Marcia Kilgore set her mind on a mission  to create the most comfortable footwear in the world. Collaborating with two British biomechanists she created a triple-density MICROWOBBLEBOARD midsole, and launched the first FitFlop sandal. Now newer BIOMIMETIX and SUPERCOMFF midsoles (engineered to diffuse underfoot pressure and deliver world-class ergonomic comfort) allow FitFlop to offer an even wider range of silhouettes within the FF2 collection. Patent-pending, original MICROWOBBLEBOARD™ midsole technology fuses three diagonal sections of multi-density EVA into a single, seamless, underfoot platform to absorb shock, diffuse high-pressure spots, and make your feet feel amazing! 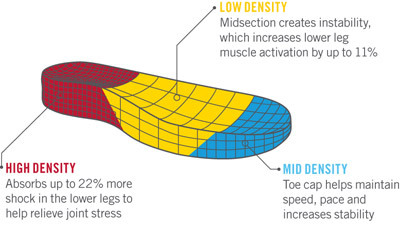 Patent-pending BIOMIMETIX™ midsole is an ergonomic, pressure-diffusing, sneaker-like layer of cush. Because at FitFlop™, believe YOUR FEET SHOULDNT HAVE TO SUFFER TO BE BEAUTIFUL.